I'm going to try to get over my compunction to have to "catch up" on everything chronologically before sharing anything more recent and share this quilt that I finished earlier this month. I love how it turned out so I didn't want to wait to share! 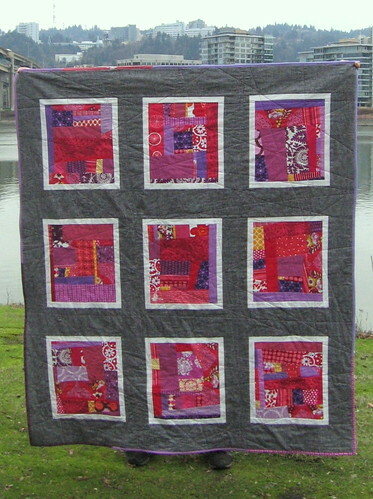 I made this quilt for a dear friend who lives on the east coast and has been having some pretty serious health troubles over the past several years that have gotten worse lately. I was feeling pretty helpless to do anything from afar, but she has been having to spend a lot of time resting and I figured a quilt to wrap herself up in couldn't hurt. I feel like I almost always am making baby quilts, so it was actually really fun to make something for an adult and not worry that it was going to be too modern or not what the parents wanted. I've been so inspired by the improv quilts that my online friends have made, especially Krista and Natalie, so it was a great chance to play around with the technique! I was pretty sure that my friend's living room had some bright red and purple accents in it so that was the color scheme I started with. The Anna Maria Horner Innocent Crush fabric (near the top left in the block above) was a great fit for both the color scheme and the feel that I was going for, and it inspired me to add pops of bright yellow/orange in each block. 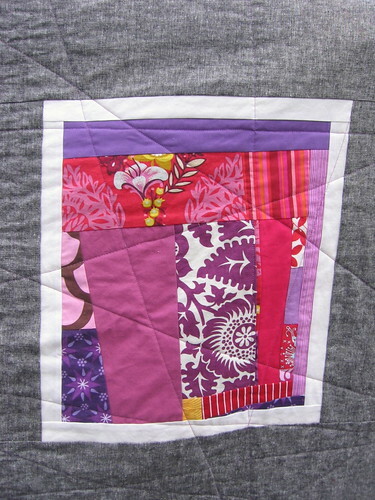 I used a mixture of scraps and cutting up some of my stash fabrics, so there is really quite a variety of fabrics in the quilt which is fun. I tried to keep the blocks interesting with some more detailed/smaller pieced parts and some larger pieces mixed in. I forgot to measure the final quilt and I don't think I even wrote down the dimensions of each block, but I am pretty sure that they were about 12"x14" before I added the white (Kona snow) borders, which I think were 1.5" strips to finish at 1" after I pieced them. I used everyone's new favorite neutral, yarn-dyed essex cotton/linen blend in black, which I just love the texture of and how it plays off the bright colors. 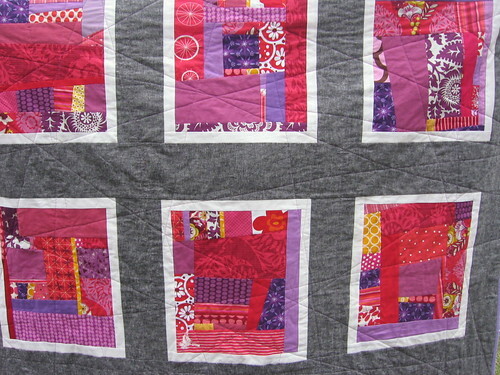 I quilted it with a random lines design which I think is a great match for the improv piecing - you can't really see it in the photos but I quilted using a lilac thread which was a fun complement to the color scheme. I also made my first scrappy binding which was a fun way to play up the scrappy, improv nature of the blocks. 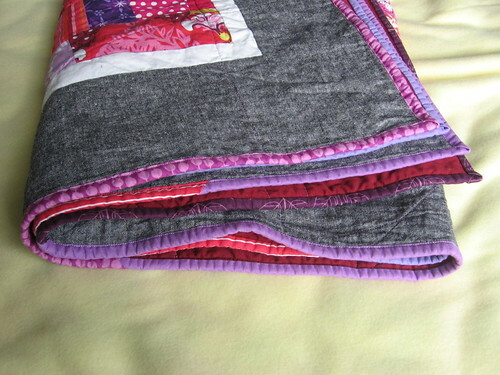 I machine sewed the binding as I have started to do more often, it just is so fast and its nice to know that it will be really durable (although I still love a hand-sewn binding too). The backing is a thrifted crimson red sheet which you can see a peek of above. 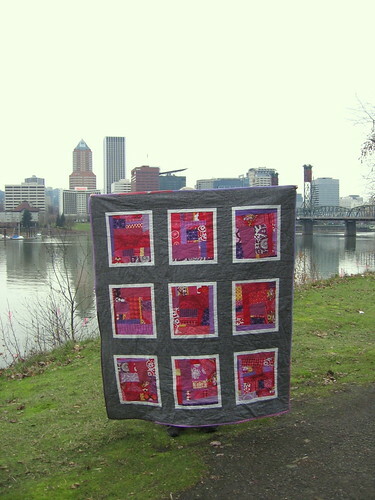 I'm happy to say that my friend loves the quilt and it's nice to know that I'm helping take care of her in a small way even if I can't be there myself! I have always had the problem when I keep a journal that I compulsively feel the need to "catch up" by writing about what has happened in order before getting to the current events... Anyone else have that problem? In any case, I seem to be falling into that same trap here. Despite my lack of energy for blogging all summer and fall, I really did do quite a bit of crafting, and I do want to share all those projects! I may need to work on loosening up and sharing some more recent stuff too, though, before I forget all the interesting details. I made both of these baby sweaters over the summer and they were both gifts for new babies that came this summer, and both made with knit picks comfy yarn (the first in worsted weight and the second in sport weight) - this is a great yarn for baby items, very soft and easy to work with and I love the range of colors it comes in. 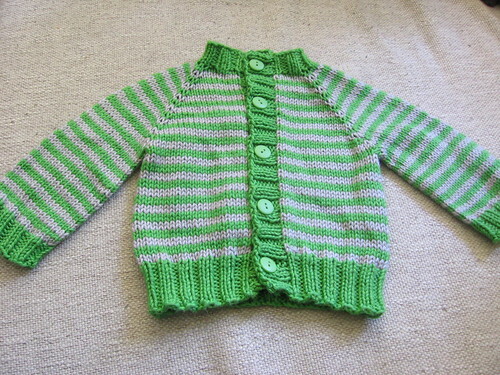 This cute sweater for my nephew was made from the little coffee bean pattern and I just love the stripes - it's really fun to browse through the other ones folks have made on ravelry and see all the color combinations. I'm definitely hoping to make one of these for our peanut at some point (maybe in one of the larger, toddler sizes that the designer sells a pattern for). 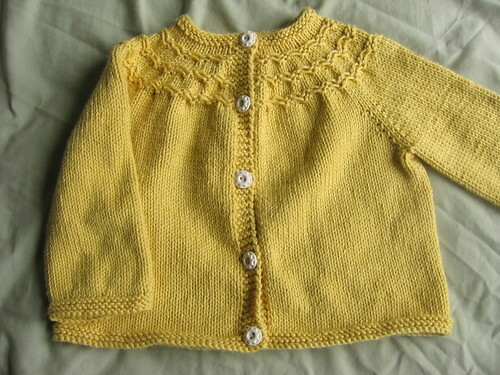 I made this yellow sweater for our friends' baby from the seamless yoked baby sweater pattern. I loved how simple this sweater was to knit, but that it still had the nice detail of the slip stitch design on the yoke. 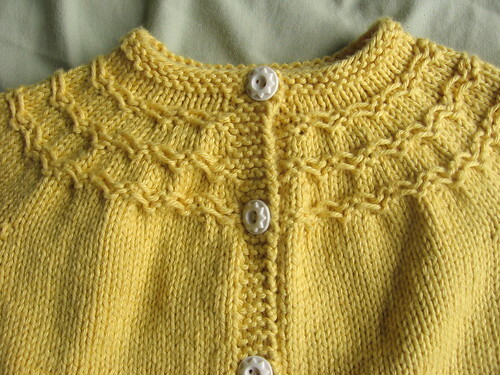 There are links on the ravelry page for this pattern to a number of other similar seamless baby sweater patterns from this designer and I'll definitely be tempted to try some of them (or make this one again). Love these cute vintage buttons that I used on the sweater too! I have three different sweaters that I've made for our baby that are all nearly but not quite finished... two just need to be blocked and have buttons sewn on and the last one I need to do some (annoying and somewhat tricky) seaming and pick up and knit a button band... I've been indulging myself with fun little new projects instead of just finishing them all up, but hopefully I'll motivate to get them all finished soon. Thanks so much for all your kind wishes on my last blog post! I am looking forward to catching up with posts on many of the things I have made over the last 6 months, and thought I'd start with a round up of some of the sewn gifts that I have made. I have been making baby crafts too so I promise to share some of what I've been making to get ready for baby soon! Starting with the most recent first, my mom asked me to make her a plastic bag holder for Christmas, and I was struggling a bit with which fabric to use until she said she really liked some scrappy bee blocks I'd made - so I thought I'd do some scrappy patchwork. I used the Anna Maria Horner Totem print as the inspiration fabric and then pulled lots of other prints from my stash that went with it to make a big patchwork block, then made up my own design to turn it into a fully lined bag holder. I'm happy to say that my mom really liked it! 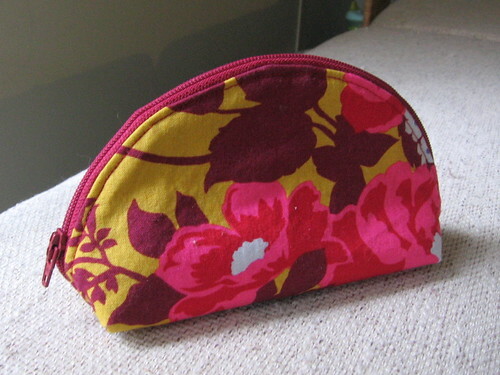 I also made a couple dumpling pouches using the tutorial from Michelle patterns, but this is the only one I remembered to take a photo of before gifting. 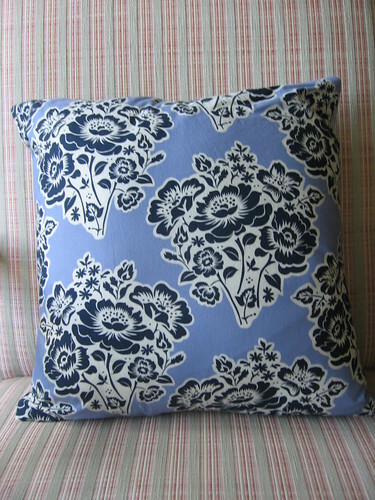 I had bought this Joel Dewberry fabric (from the heirloom line) without a specific purpose so it was fun to get to put it to use! It was fun to try the pattern, this was the first time I had done a curved zipper like this and she explained it very clearly, I was really happy with how it turned out. I only tried the "easier" curve one but maybe if I make more I will venture the smaller, curvier one! 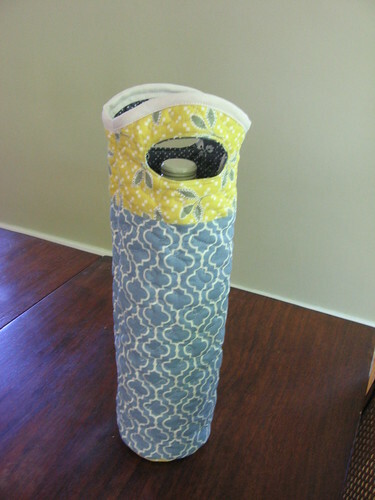 Earlier in the year, I made my mother in law a quilted wine tote using my tutorial for her birthday. It's always funny to go back and follow your own patterns/tutorials when you haven't looked at them in a while! 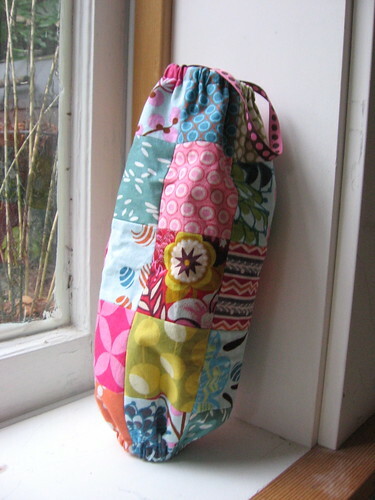 This time, I used insulated batting to make the tote so that it would help keep wine chilled in transit. For her birthday, my mother had asked for some throw pillows with fun fabrics - I love Sandi Henderson's secret garden fabric line, and it reminded me of my mom and the colors she likes, so I used mostly fabrics from that line and then some other coordinating fabrics from my stash. 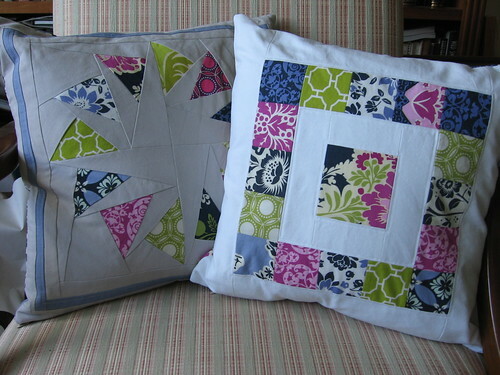 The pillow on the left is a flying geese block with a kona ash background, and the pillow on the left is a design I made up with a white background. I like them both although I think I like the clean look and contrast of the white background a bit more. 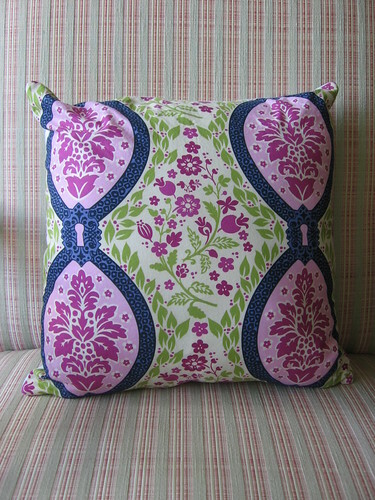 And I couldn't resist showing off a few of the great fabrics in this line on the backs of the pillows! Hope your new year is off to a good, crafty start!